Today's color challenge at SCS (CC379) is Cajun Craze, Baja Breeze, and Cherry Cobbler ... with the dessert being - add Lucky Limeade as greenery (flowers, leaves, trees). Well, those colors together were definitely a challenge for me! I decided to go with a window flower box on a brick house ... I tried adding a distressed look to the window and flower box to match the distressed look from the brick embossing folder. Hope you like. I ran the embossing folder through my Big Shot with Confetti Cream cardstock. I used a sponge dauber to add Cajun Craze ink to the embossing (and a little Early Espresso ink). I ran the flower box die and window die through the Big Shot with Crumb Cake cardstock (cut two flower boxes). I took my Early Espresso ink pad and swiped it across all three pieces several times, pressing fairly hard and always pulling in one direction. I added a piece of Confetti Cream cardstock behind the window, adding dimensionals in between and mounted it to the embossed card front near the top (my plan was to add a sentiment on the bottom - but I didn't like how that looked so left it off). I find the easiest way for me to "build" the flower box is to add temporary adhesive to the back of one flower box and lay it on my work surface. I ran the Leafy Branch die-cut and Leaves die-cut through my Big Shot with Old Olive cardstock three times (I didn't end up using all the dies). I added a sticky strip along the top of the flower box and started adding leaves (or pieces of leaves) until I was happy with how it looked. I then placed the second flower box on top, placing dimensionals in-between. I mounted the flower box onto the bottom of my window. I ran the Wildflower Patch die through my Big Shot with Baja Breeze cardstock and then cut the stems off all the flowers. I punched several hydrangea flowers from Cherry Cobbler cardstock. I used my mat and stylus to shape the flowers, added a white center to the Cherry Cobbler blossoms with a white gel pen and then randomly glued the flowers on top of the leaves. I added two small leaf sprigs to the front of the box, tucking the ends under flowers. I added an embossed brick panel to the inside of my card, with a Confetti Cream writing panel in the middle. This card is too cute. I love the brick. So realistic looking - wonderful card! Oh wow! What a great card! 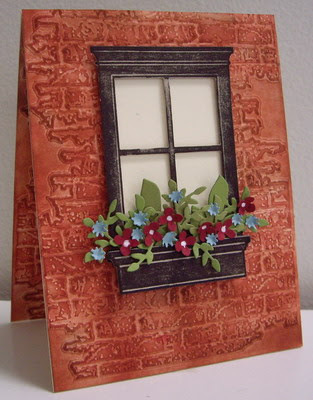 I love this card, Loll - you did a great job making the wall and window look distressed, and a fabulous job on the flowers in the window box. Awesome Card! What a creative way to use the colors from the color challenge. Your cards always inspire me! This is terrific, love this card! Brick wall is a nice complement to the flower box. fabulous Loll! I have this brick folder and a brick stamp... oh, I can't keep up with the inspiration from you! hehe Love all the inking, extras... they make the card! Hello Loll. I have been strolling through your blog, and just had to tell you how much I love your creations. This card is so wonderfully textured. I love the window scene you've created. The inking on the brick and the window frame is marvelous. The colors you've used for the flowers are perfect with the main colors you've used. I just love, love, love it! This is a truly beautiful card. Thank you for going to the trouble of explaining how you made it! That is so much help to know how a card is made. I just got a brick embossing folder and your explanation gives me some good ideas how to use it. Thanks! Just beautiful !! Will you posting this on your Pinterest, as I just found you on there? I absolutely love this card. Love the look and the colors.